On Saturday, September 5th, 2009 there will take place a traditional food market in the Piazza della Peschiera from 9 am to 2 pm. There visitors have the opportunity, to buy the typical products of the region at an extremely low price. In addition, there is no better way, to come into close contact with the local farmers and to learn about their traditions. In order to promote the encounter between the world of production and consumption, the market will be repaeted on the first Saturday of each month. During a visit of this popular market is also worth visiting the museum Guarnacci in Via Don Minzoni, one of the oldest public museums in Europe. It was founded by the abbot Mario Guarnacci (Volterra 1701-1785) in 1761. He bestowed a great archaeological heritage, which he has accumulate during his years of research and purchases, on the town of Volterra, . In addition, he donated a rich library with more than 50,000 volumes. 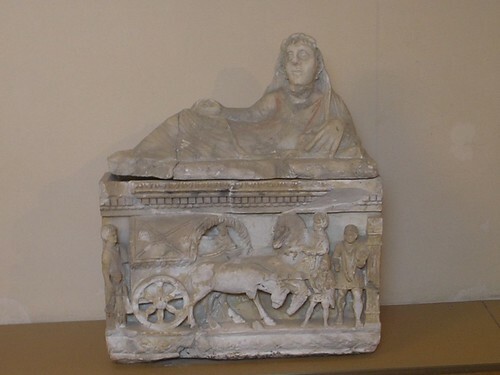 The museum is the most important one in Tuscany, where the tourists can admire numerous findings, including many ash urns, made of marble or alabaster on which funeral scenes are often depicted: the dying on a horse, accompanied by friends and family. The magnificently restored Palazzo Minucci Solaini in Via Sarti 1, houses the art gallery. Especially in the upper exhibition rooms the visitors get impressed by the works of Pietro de Vitte – life-size figures with mimic expressions. 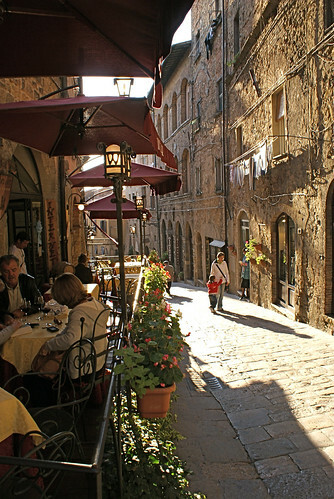 The whole Era Valley is, like Volterra, rich in history and culture. We offer you for your holiday unique cultural packages with accomodation in lovely wineries amidst the enchanting hills.